SlideRocket, an online presentation application that produces slideshows that rival (and in many cases, better) PowerPoint, has launched to the general public. The site had previously been available under a public beta, and is now removing the beta tag and introducing a set of pricing tiers along with some impressive new features. Since we last wrote about SlideRocket the site has introduced new collaboration tools that allow users to share slides and other assets between presentations. 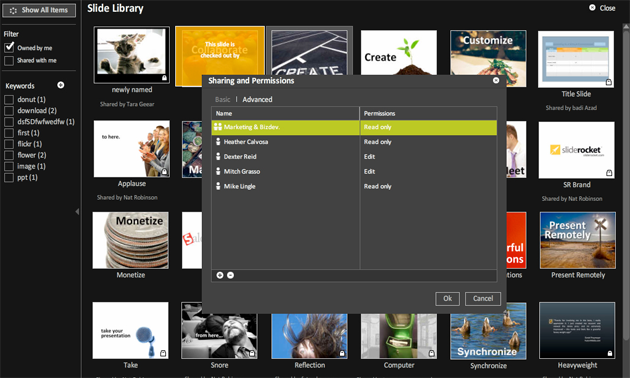 Users can establish which assets will be made available to specific groups of peers using granular permissions control. The site also supports a conference mode similar to WebEx, allowing users on different computers to view the same presentation simultaneously (unfortunately this doesn’t yet support audio so you’ll need to set up your own phone or VoIP call independently). The site has also introduced a storefront described as an “iTunes For Presentations” that allows users to purchase assets for their projects. Users will be able to buy stock photos through a partnership with Fotolia, graphics and backgrounds from PresentationPro, and printing/delivery through Mimeo. Even though some of SlideRocket’s cloud-based competitors are free (SlideRocket charges for its more advanced features), the site is still very impressive and will likely draw a steady stream of business. It will be hard to displace PowerPoint as the de facto tool to build presentations, but SlideRocket is a great alternative, especially because users don’t have to deal with incompatible file formats and different versions of Office. Other players in this space include 280 North, Empressr, and Zoho.